Guyana Chronicle:- A RECOMMENDATION has been made for the Government of Guyana, when it starts production and receives its net inflow of revenue, to make cash transfers annually to every household in the country. “I believe that some portion of the net cash flow from oil should be dedicated to be given as cash transfers to every single household in this country. Whether it is US$5000 per year or whatever it works out at, we can put the figure together – there must be a mechanism in place to ensure every single household and by extension every single person would see the benefits of oil and gas in terms of cash or cheque received in their accounts,” said economist Professor Clive Thomas. 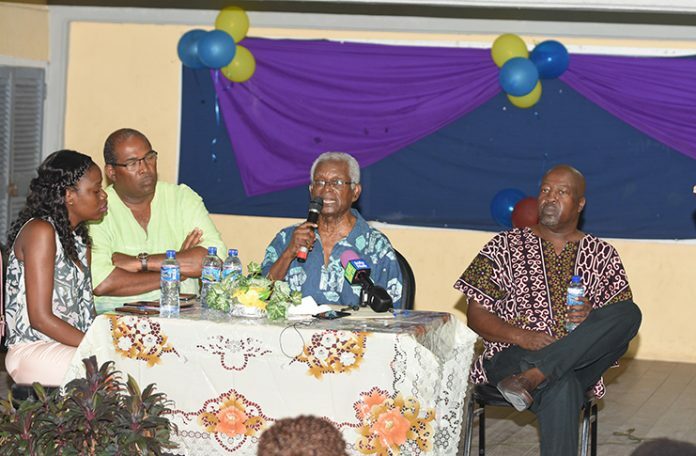 Professor Thomas was at the time addressing residents of Buxton, East Coast Demerara and other stakeholders at the Eusi Kwayana Emancipation Symposium, held at the Friendship Primary School. Professor Thomas posited that there can be no better spender of resources than a person in need. Professor Thomas, who was among three panellists, Attorney Nigel Hughes and Project Officer, Ministry of Natural Resources, Mariscia Charles, made it clear that despite the views of some, he does not believe giving cash transfers to persons “is a waste of resources”. He noted that such a recommendation would be frowned upon by the International Monetary Fund and the World Bank. “If you look at the evidence, cash transfers are the single most effective means of combating poverty,” he stated, while acknowledging that there is a risk involved. As such, he noted that there must be careful planning if such is to be implemented by the government. “There is a risk that the politicians might steal it but there is no certainty about that,” he opined, while noting that positions must be taken in favour of the poor and powerless. He called on the administration to put mechanisms in place to ensure that the masses benefit and not the middle-class, which has already started benefiting from oil-related opportunities. This benefit he said can improve access to education, and better health care. He chided critics who do not believe in such a vision and noted that had it not been for such an opportunity to speak at the Friendship Primary School, he would not have got a chance to express such a point of view. At the conclusion of Thomas’ presentation, chairperson to the proceedings, Dr. David Hinds, suggested that there be detailed discussions on the subject and how such an initiative can benefit communities such as Buxton. “It is not the money in our hands, but what we will do with it,” Dr. Hinds reminded. His view was supported by attorney Nigel Hughes who believes that there needs to be data to support such a recommendation. He noted that generations have changed over time and in his view, the goals and aspirations of communities are not necessarily the same. “My fear is that if we start to talk about giving people cash, we opening the doors to politicians to say I can give you more cash than the next one and we end up with a ridiculous campaign of people being irresponsible about development, because it becomes a competition on who can give more,” Hughes stated. “We are living in a different social era with different commitments and views on development,” he stated, as he gave commendations to Muammar Mohammed Abu Minyar Gaddafi, Libya’s former leader. He said when Gadhafi took power, during his first 10 years in office, there was a rise in the level of education, and the country became debt-free. He said the level of literacy increased to 95 per cent and health care there was second to none, giving Libya a first world country status. Hughes made it clear that Guyana needs a similar model, where the essentials are provided across the board to citizens, even as he called for sensible discussions on the issue and not “hot air” as is published in the national newspapers. He believes that every discussion needs to have a data factor, so that citizens are not “dazzled by the fantastic promises that are going to come from the political pulpit unrelated to reality and economics of sustainability and that is a dangerous place. “We’d be running down the road voting for who’s giving us more money without any thought about how they’re going to pay… and when they get in they will pay themselves and we get none,” he added. In addressing the concerns raised by not only Hughes but attendees, Professor Thomas made it clear that each transfer must be conditional, while noting that there are many ways the mechanism can be employed. Professor Thomas who has published many articles in the local media on Guyana’s new found natural resource, noted that the change in the current generation was brought about by the current social and cultural environment. “It is not as if I am asking for all the oil wealth to go to cash transfer; I am saying take a percentage, take two per cent, four per cent, five percent — have a limit – and build into it a recognition that if the price of oil goes down, the percentage remains the same — so the limit of exposure is predetermined so that you don’t run the risk of creating a fiscal crisis,” he stated. Meanwhile, Thomas noted that the sudden-wealth or lottery syndrome where persons encounter lots of money, but struggle to maintain same as a risk but prefers to be optimistic. “It is not as if there are no risks… I am not claiming that cooing for cash transfers means people might not spend it on consumption or wastage, but I am saying they would better conserve it than any other outside agencies– local or central government,” the professor added. “They are not going to just take it and sit back and consume and wait for a cheque… So it is a gamble that I am taking, but historical experience has been on my side,” he stated. Presentations were also made by the two other panellists, Hughes and Charles.